You are here: Home / My Projects / Bathroom Design / Fresh and Clean Bathroom Remodel – From Green to Great! Seriously, when I look from one photo to the other, I take a deep breath. 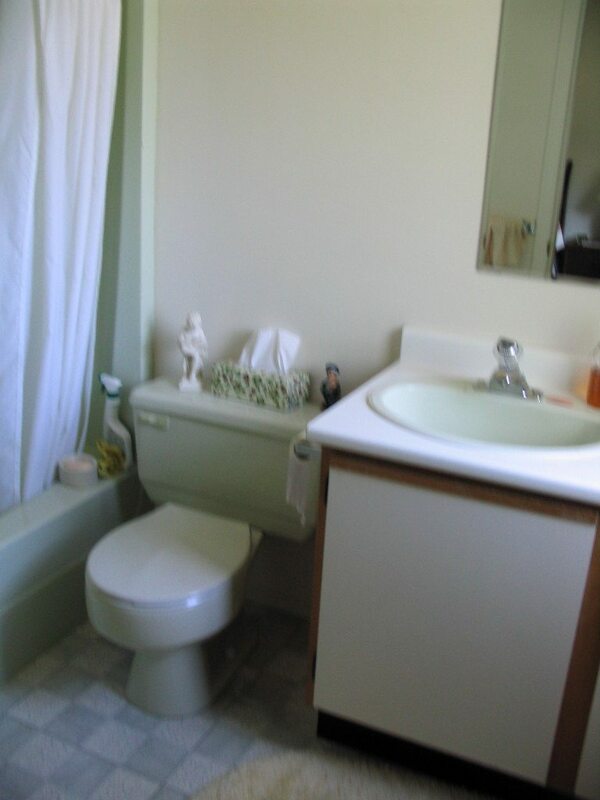 It’s like my brain couldn’t quite comprehend the goober green of the toilet and tub combo. Now, the space is restful and soft with just whispers of colour mixed in with the neutral palette. Paint Colour: Benjamin Moore Gray Cashmere. 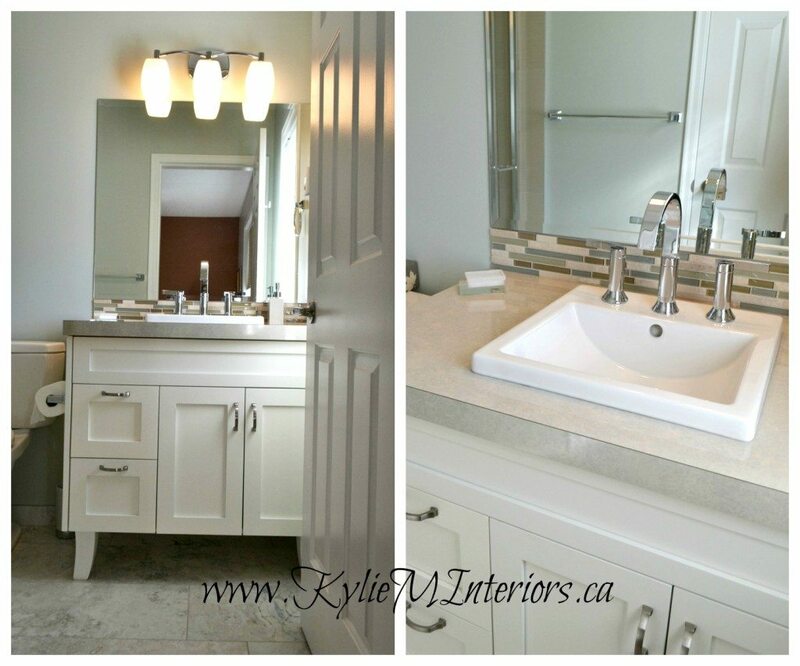 We chose a square, raised edge sink with sloping interior rather than the typical oval. It kept things simple and consistent. We also chose a high-end laminate countertop in a gloss finish to mimic the look of quartz or granite. Need a new vanity? Check out these great options! Ahhh, need I say more? I usually do, but not this time! Want ideas for your own bathroom update? Check out my affordable Decorating and Design Consultations! I love both of these bathroom makeovers. I will be redoing my master bath soon and it is the same layout as the first one showcased here. Thanks for giving me some great ideas. Great job!! Thank you Alli, I madly love the 2nd one with Gray Cashmere on the walls – sooo relaxing! I see some great ideas here, thank you Kylie! 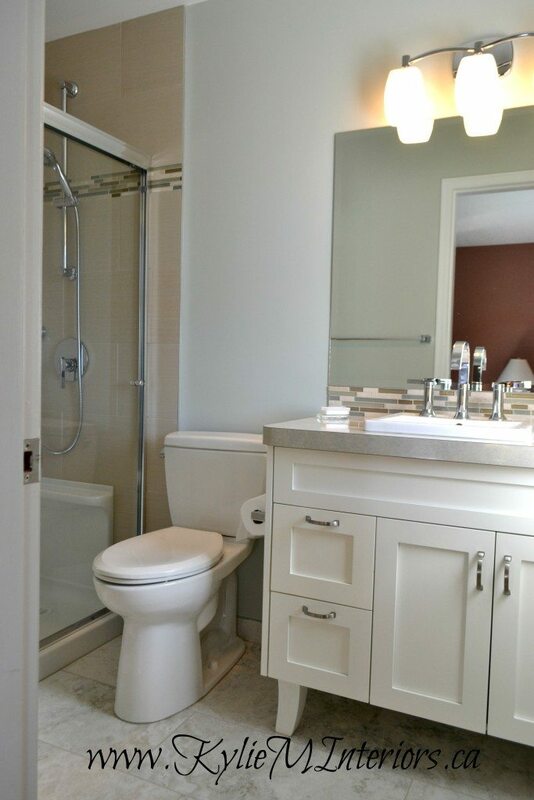 Can you tell me where the white vanity in this bathroom was purchased? I love the clean look it gives this room. Hi Janet, it’s actually a custom order from Mid Island Cabinets in Nanaimo! It is a lovely piece, isn’t it…but it wasn’t cheap…..
can you tell me where the backsplash tile came from?? I LOVE the colors in it.